New to the Davonport showroom in Colchester, our Holkham display demonstrates a relaxed, classic style that bridges the gap between rustic country and urban kitchen design. 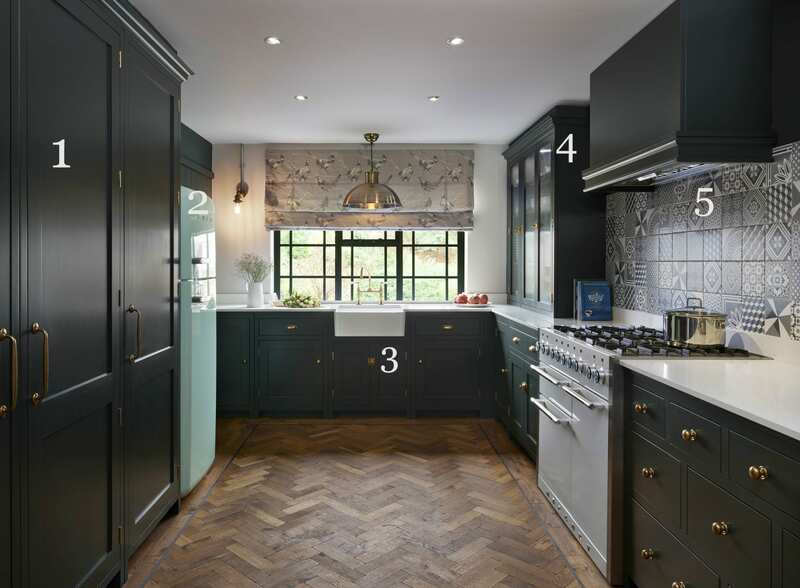 Designed as a kitchen/utility room, the Holkham kitchen features a butler sink, range cooker, glazed dresser and bank of utility cupboards. 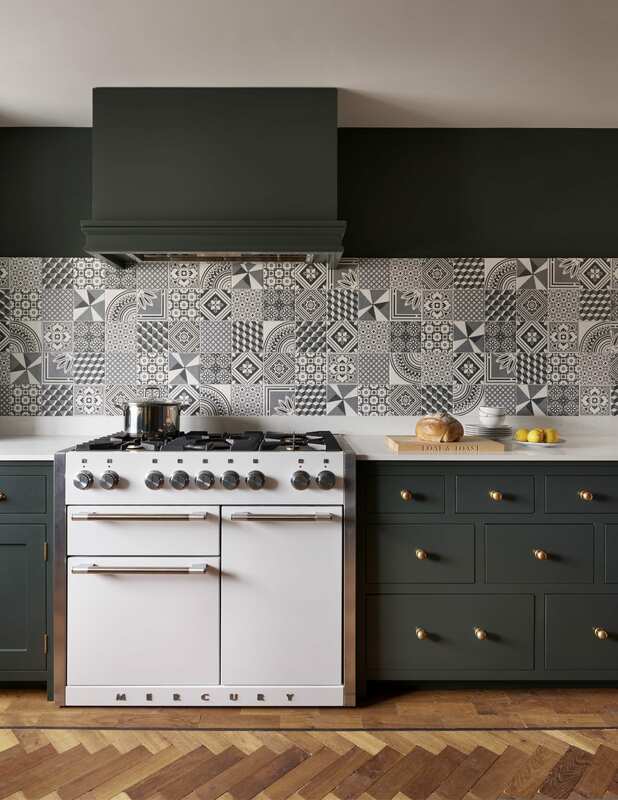 With statement geometric tiles and a quirky Smeg fridge to complete the room, our Holkham kitchen combines contemporary style with the classic charm of years gone by. 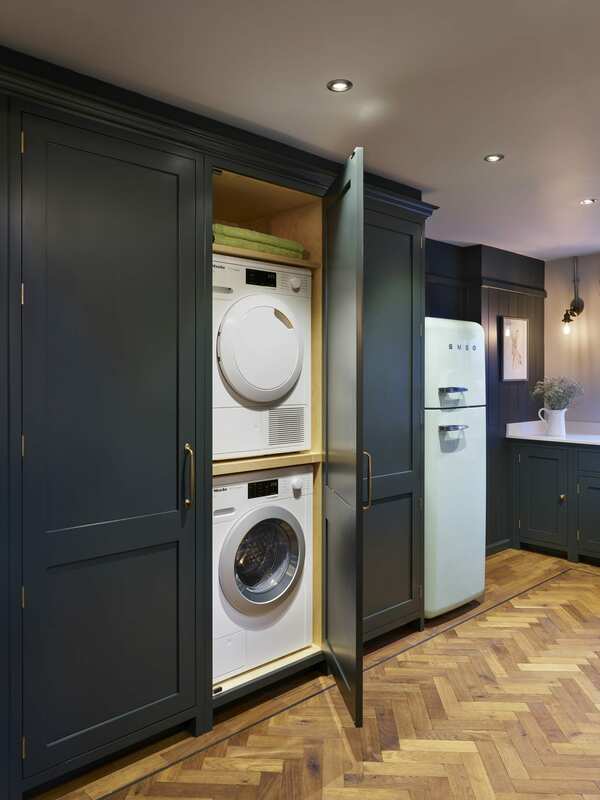 The bank of tall utility cupboards are designed to store and disguise the necessary (but ugly) features of every busy home. 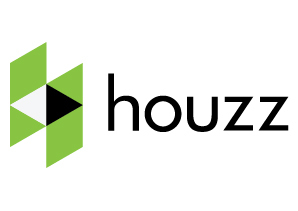 Essentials such as the washing machine, tumble dryer, vacuum cleaner and cleaning products all have to go somewhere. But if you don’t have a designated utility room these can end up taking up space in a downstairs cloakroom or garage. Tall utility cupboards cleverly hide it all away whilst keeping these items in their most practical position – the kitchen. 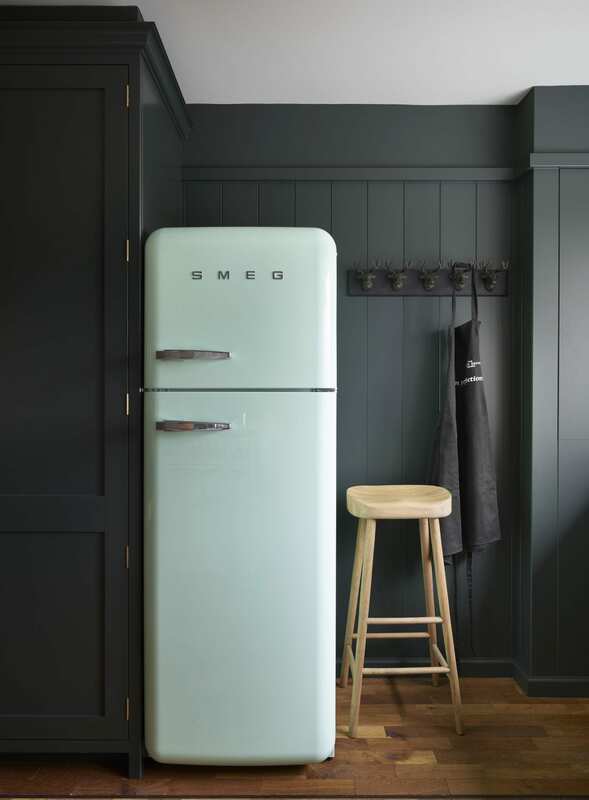 Iconic in its style, the Smeg fridge has become synonymous with quirky, on trend homes with the kitchen designed as a place to have fun. 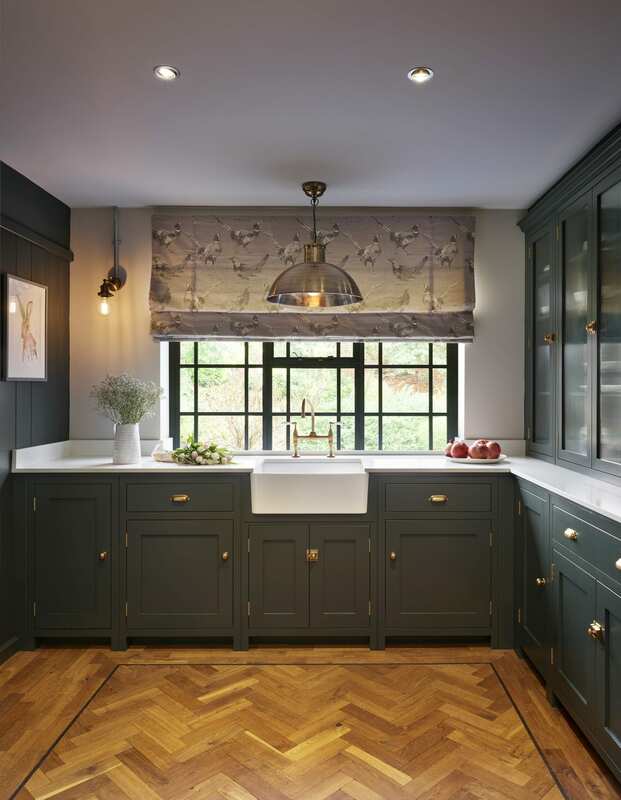 Our choice of mint green Smeg fridge juxtaposes the dark green cabinetry and wall panelling, off set by the warmer tones of the oak parquet flooring. Rather than discreetly hidden behind cabinetry and beneath the worktop, the butler sink in our Holkham kitchen stands as a focal point. Reminiscent of traditional British kitchens, the butler sink has a classic feel harking back to a quintessentially English country style. A simple, understated combination of brass hardware, dark cabinetry and light worktops sit beautifully against the stark white ceramic sink, bringing the traditional country butler sink into a more contemporary setting. 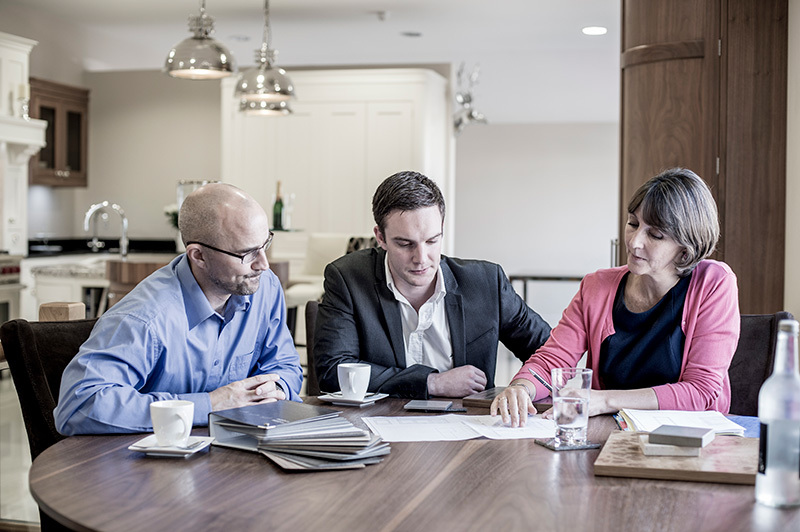 Glazed cabinets and curiosity cupboards are growing in popularity and using fluted glass adds interest and detail to the design. Glass panels in cupboards help to break up a block of colour and inject more light into the space. 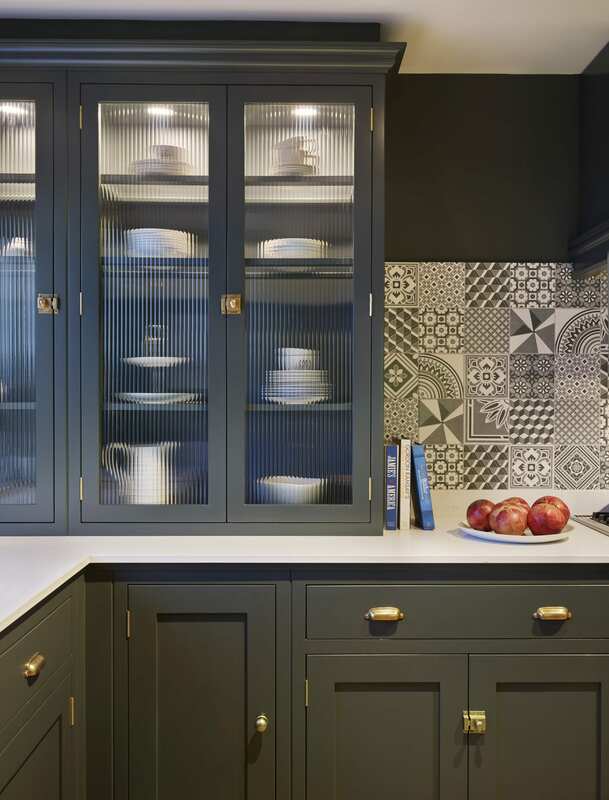 By choosing fluted glass, the aesthetic impact is softer and the contents are partially hidden, as demonstrated by the glazed dresser in our Holkham kitchen, meaning it is much more user friendly and practical for busy kitchens. 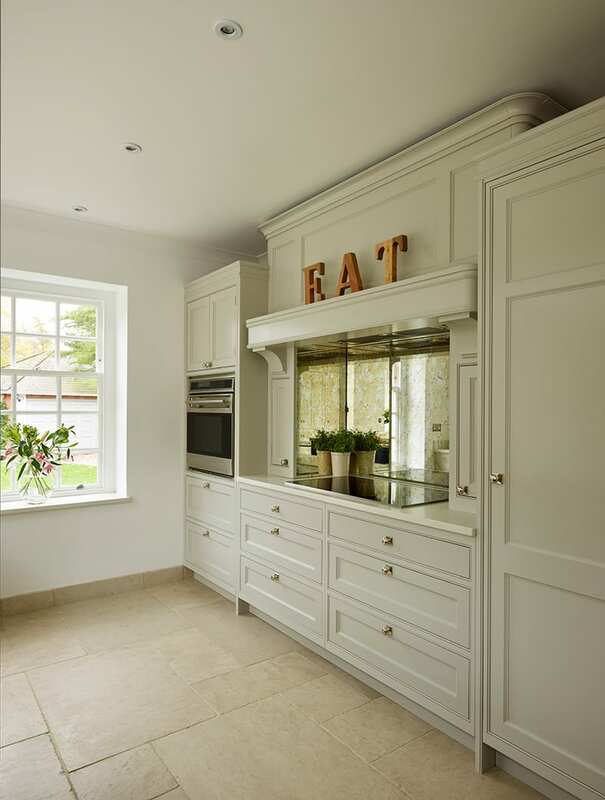 A signature feature of our Holkham kitchen is the Holkham canopy, seen here above the Mercury range cooker. Designed to make an impact and feel part of the architecture of the room, it’s best complemented by a statement cooker. The white range cooker and geometric tiled splashback in a palette of white and grey is a stunning example.